How's that for a fun tropical palette or spring flowers or.... whatever you wish!! The background was created with MFT's new cloud stencil and Beach Scene Builder dies. Next I die cut some of those sweet Birdie Brown Penguins, die cut with the matching dies and did a little copic coloring. Added the sentiment from the same set. Thrilled to have y'all playing along!! Once you’ve finished your card or other paper-crafted project, add a direct link to your creation using the Inlinkz tool at the bottom of the Color Throwdown post. 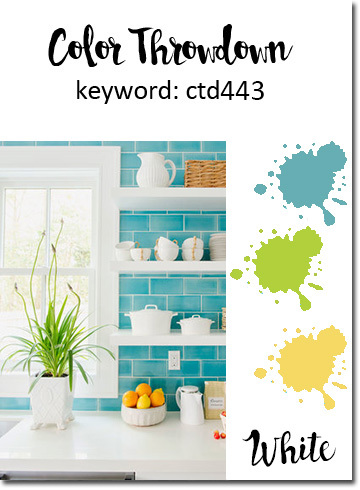 And, don’t forget to use the keyword CTD443 if you upload your project to an online gallery, or hashtag on social media with #ctd443 and/or #colorthrowdown. These penguins are so adorable, and I love your super fluffy clouds! !